Happy October 1st!!! It's pumpkin season. Autumn rocks, the air is crisper (finally) and I'm pulling out the boots and leggings. Fall is also time for warmer foods and I've definitely felt more like cooking lately. Indian food is life. I love it, I love the ingredients and especially the spices. They are so warming and filling and SAVORY! It's so easy to make indian food vegan because you can use coconut milk and olive oil instead of butter. You also get your whole grains in rice and protein with the chickpeas. I've made a few indian dishes but this one is my favorite. I did add sea salt to this dish but I also added a ton of spices. The best ingredient was the awesome tomatoes I picked up at the farmers market, nice, big juicy red tomatoes that were perfect for sauce. 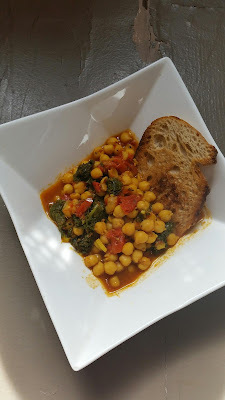 I made chickpeas from scratch and instead of making rice, I ate this dish with organic bread I also bought at the farmers market. Make note of these spices so you can stock up: turmeric, curry powder, ground cumin, fresh garlic, ground ginger, sea salt and pepper. I usually buy all my spices from Trader Joe's; they are affordable and they have a pretty wide array of spices. Grab their cinnamon and pumpkin spice too! Prepare the chickpeas the night before if you are making them from scratch. Soak them overnight, rinse them the next day and cook them on the stove. Add 3 cups of water for every cup of chickpeas and cook on low heat with the lid on the pot. The chickpeas are done when they are soft. Dice the tomatoes, cut the kale into small pieces and chop the shallots into small pieces. Add the tomatoes, shallots and kale to the saucepan with some olive oil and the fresh garlic. Keep the heat on low; you want to cook everything very slowly so the spices seep into the ingredients. Add some of the water from the chickpeas to keep the dish simmering. When the veggies are heated and beginning to cook, add each of the spices. The tomatoes will turn into more of a sauce. Stir the veggies and spices so that all the ingredients are covered in spices. When the veggies are almost done cooking, add the chickpeas to the mix and stir again. This should all take about 45 minutes. The dish is done when the tomatoes are a thicker sauce, the shallots are transparent and the kale is bright green. Serve in your favorite bowl with some bread or rice. 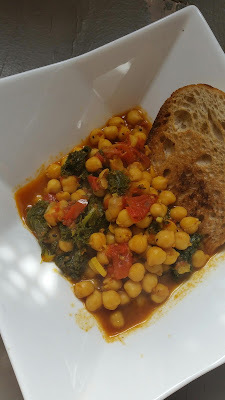 I loved dipping the bread into the chana masala; it was so savory and filling. If you're making rice, season it with a little olive oil and curry powder. This dish is YUM! Want my recipes delivered right to your inbox? Sign up here. Want more never before seen recipes? My ebook is filled with dishes, desserts, smoothies and juices. Buy it on Smashwords or Amazon.